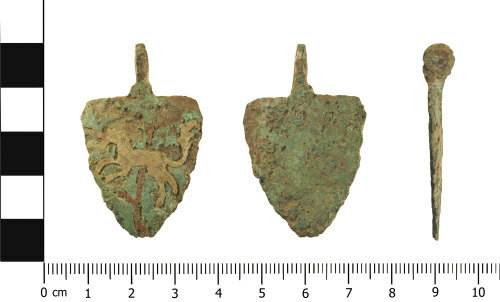 A cast copper alloy heraldic harness pendant of probable 14th-century date (c.AD 1250 - c.1450). The pendant is shield shaped in plan and is complete with the suspension loop. The inlaid enamel surface is complete on the unicorn, this being yellow in colour. The enamel surrounding the unicorn is damaged and is now a mid-green colour. The same green coloured enamel is also seen on the reverse. An integral cast suspension is located on the upper edge at the centre. The loop is set at an angle of 90 degrees to the plane of the pendant. The pierced loop is complete with a circular perforation. In the areas where the enamel has been damaged the harness pendant has a mid-brown coloured patina. Similar shaped horse harness pendants have been dated to the middle of the medieval period, specifically the 14th century. Other examples with a unicorn have been recorded by the PAS, this includes pendants discovered in Norfolk (NMS-566003), Essex (ESS-6F89E7) and two examples discovered in North Yorkshire (IHS-E3D047) and (IHS-E42161) that are linked to the Meautys family, who used the colour azure on their arms and a unicorn salient and/or erminois. The pendant measures 44.06mm in length, 27.62mm width, and is 2.36mm thick. It weighs 9.6 grams.